Handicap Bathrooms are much easier to use of than conventional bathrooms. Installing a handicap shower stall with the shower floor level with the bathroom floor it allows seniors, the disabled and people of all ages to enjoy safe and comfortable handicapped accessible bathrooms without sacrificing style. A "barrier free" wheelchair shower helps people with limited mobility to enjoy a walking into the shower without barriers or for a wheelchair to be rolled directly into the shower over a collapsible water dam or water stopper. Caregivers can easily assist in transfers when you replace your bathtub with a roomy roll in shower stall. Wheelchair Accessible Showers are Safe and Comfortable for People of All Abilities. Increase your Freedom and Independence in Bathing. Brenda who lives in Portland, Oregon believed she would need to move from her home of 43 years because she was becoming more disabled and was concerned about slipping and falling in the bathtub. Instead Brenda replaced her bathtub with an Accessible roll-in or walk in shower. To minimize cost Brenda installed a pre-fabricated unit, which was easily accommodated by her existing space and plumbing. A few different Handicap Showers fit in the same 5 ft. space as her standard tub with a drain at the same end. Brenda looked at walk in bathtubs, but preferred the handicap bathroom Accessible Shower idea. 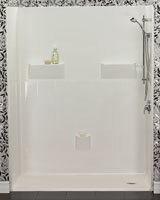 The new roll in disabled shower took only 2 days to install and Brenda was able to shower safety in the home she loved. For additional comfort Brenda added a shower safety grab bars, a shower chair and a hand held showerhead, which mounts to a slide bar. An additional benefit was when Brenda's grandchildren came to stay they also could easily use the shower as the showerhead was adjusted to their height with no trouble. 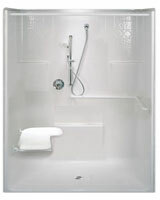 An wheelchair shower stall can be installed where your bathtub is today, with minimal renovation disruptions. 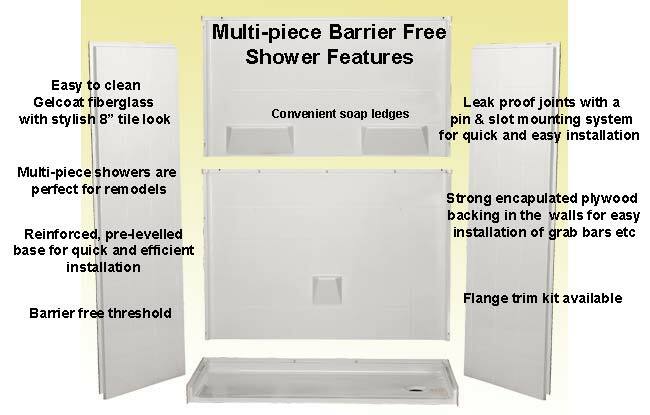 A skilled tradesman can typically install a barrier free shower in 2-3 days. Your new handicapped shower is helpful to people of diverse abilities, from an elderly parent with limited mobility to an agile teenager. Universal design principles offer better access for all users. Handicap Showers come in many different models and sizes. First decide if you need a multi-piece or one-piece shower unit? A one-piece walk in shower is typically for new construction or additions when bringing the shower into the house is not a problem. Many Handicap Shower models are constructed of fiberglass with full plywood reinforcement in all walls for outstanding strength. The strong design, easily supports the customized installation of fixtures (taps and showerheads), grab bars and shower chairs. A luxurious attractive gelcoat finish is durable and scrubable. Tile look wall patterns offer no grout cleaning hassles. Available in many colors with numerous color accent tile options. Handicap Accessible Shower Bases, are included with all Accessible and ADA Showers and are also available to be purchased individually. The handicap shower pans have slip resistant self-supporting pre-leveled bottom allowing you to do snap in style installation without any mud setting. A variety of threshold styles are available to accommodate your individual needs. Multi-piece handicap access shower stalls are for bathroom remodels to an existing home, as a one-piece shower will not fit through the doorway. Multi-piece handicapped accessible showers are often used for replacing existing bathtubs, or for other projects such as adding a shower to the main floor. It is important to know the space you want your shower to fit into and where the drain is located. One-piece shower units are for room additions or new construction because they most often do not fit through existing doors. 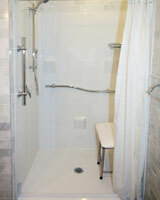 One-piece showers are more economical and are ideal to add to a new home or bathroom addition. The American Disabilities Act resulted in ADA standards and guidelines for accessibility to places of public accomodation and commercial facilities by individuals with disablilities. ADA Shower models include both ADA transfer showers and ADA roll in showers. 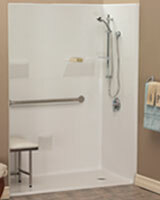 All ADA Showers are ADA compliant when accessorized in according to ADA standards. 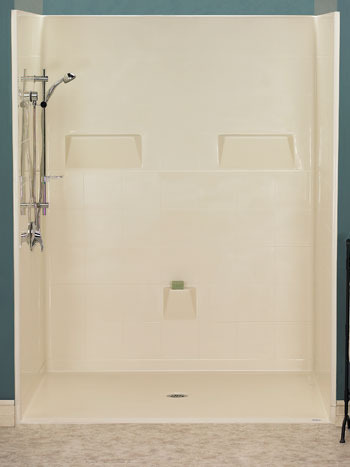 Accessible Showers offer the same easy access and accessories as ADA showers, however they are designed to fit in standard residential bathroom framing pockets, such as the the standard 5 ft tub/shower found in many North American homes. 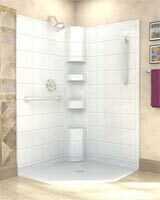 Many people will buy ADA compliant Handicap Access Shower Pans to provide a snap in solution for the shower base. 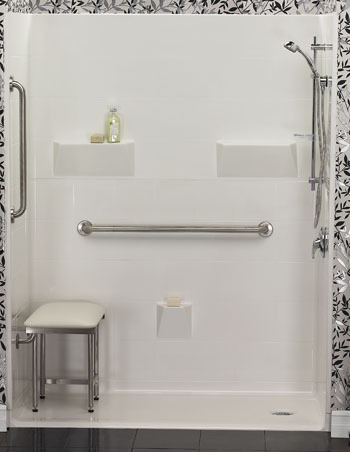 This barrier-free pan can be combined with ceramic tile walls for a beautiful custom accessible shower. The handicap shower bases have slip resistant self-supporting pre-leveled bottom allowing you to do snap in style installation without any mud setting. An ADA shower pan ensures ultra-low thresholds for easy access. Prices do not include accessories, shipping & installation. 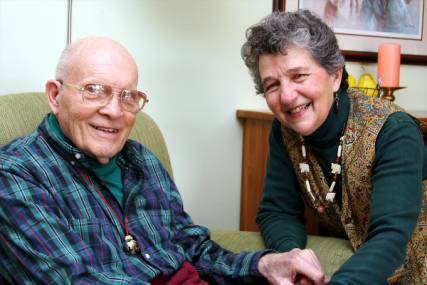 George and his wife Lillian live in Orlando, Florida. George has fallen and now uses a walker for stability both outdoors and in the home. George cannot step into and out of the tub. George is not comfortable allowing anyone but Lillian to assist him with his bathing needs. Lillian is a slight woman and cannot support George's weight. 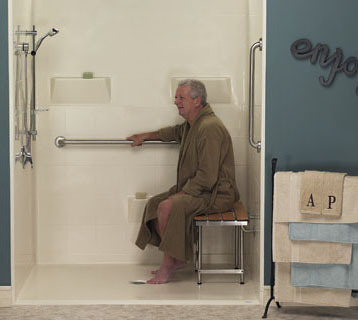 After installing an elderly shower George is able to take his walker right into the shower and use the shower seat. 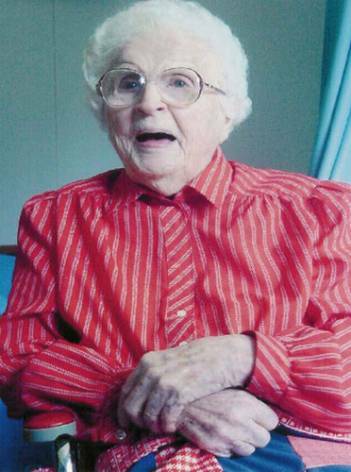 Lillian can easily assist George, however with the use of bathroom safety grab bars and a fold down shower chair for the elderly George has been able to shower without assistance. Accessible and ADA compliant Showers come with a 3 year manufacturers limited warranty, on defects for three years for the fiberglass shell. Any accessories or jetting parts are subject to the particular manufacturer's warranty. Shower units meet UL and CSA standards for safety and have been tested to meet industry fire rating standards. Call 1-877-947-7769 to be Showering in your own curb free shower. The Accessibility Professionals team has assisted many people and organizations to transform their bathrooms, making them easier to use.